HEALTHVIT FITNESS L - TYROSINE L-Tyrosine is an essential amino acid which supports brain function. It can be converted by neurons in the brain into the neurotransmitters dopamine and norepinephrine (noradrenaline), hormones which are depleted by stress, excessive work and certain drugs. By replenishing norepinephrine in the brain, mental energy levels are enhanced and a feeling of contentment often occurs. 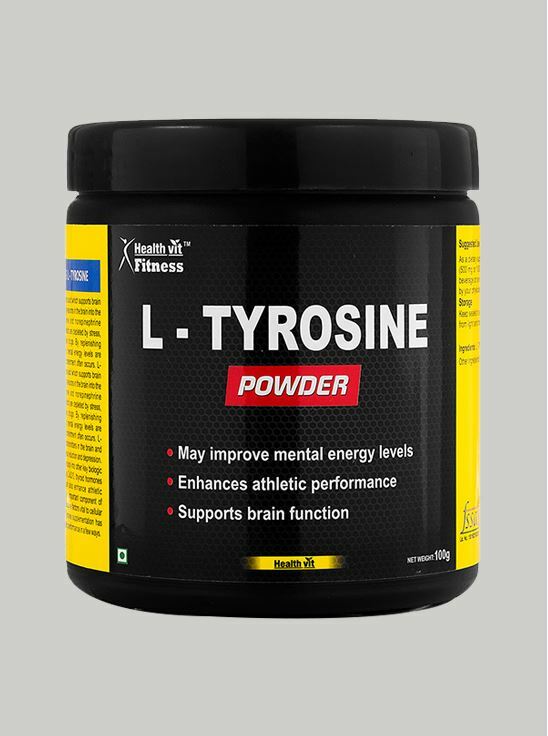 L-Tyrosine is an essential amino acid which supports brain function. It can be converted by neurons in the brain into the neurotransmitters dopamine and norepinephrine (noradrenaline), hormones which are depleted by stress, excessive work and certain drugs. By replenishing norepinephrine in the brain, mental energy levels are enhanced and a feeling of contentment often occurs. L-tyrosine boosts certain neurotransmitters in the brain and has been used to support stress reduction and depression. L-Tyrosine is converted in the body into other key biologic compounds, including L-dopa, CoQ10, thyroid hormones and melanin. Tyrosine can also enhance athletic performance. L-Tyrosine is an important component of protein and helps form the bioactive factors vital to cellular growth and maintenance. Tyrosine supplementation has the potential to increase athletic performance in a few ways. • May improve mental energy levels. • Enhances athletic performance. • Supports Brain Function. Suggested Use : - As a dietary supplement, take 1 or 2 scoop(s) (500 mg or 1000 mg) mixed into your favorite beverage on an empty stomach, or as directed by your physician. Storage Keep sealed in a cool dry dark place - protect from light and moisture. Ingredients :- L - TYROSINE Other Ingredients: None NUTRITIONAL INFORMATION :- Servings Size: 1 scoop (500mg) Serving Per container:200 Amount per serving. CAUTION • Not recommended for children. • Do not exceed recommended serving size. • Diabetic patients, pregnant or lactating women and patients suffering from other diseases need to consult with a healthcare expert or dietician before consuming this product. • This is a dietary food supplement and is not intended for medical use. • Store in a cool and dry place. • Contains artificial sweetener (Sucralose) .